Pin cushion made from star burst patterned fabric. Embellished with a coordinated handmade fabric button. Generously filled with polyester stuffing. An essential for any sewing room or craft work space. Folksy :: Buy "Pair of Christmas Stockings Tree Decorations"
This pretty pair of stockings are made from a patchwork of cottons, and are finished with ribbons and buttons. They have a pretty ribbon hanger. Size approx 11.cm x 11cm. 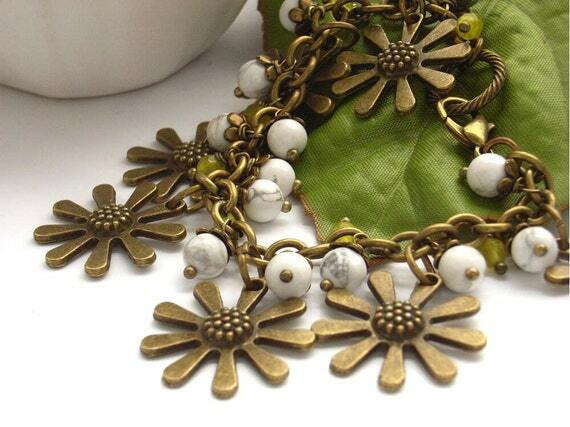 Vintage style bronze tone daisy flower charms with white howlite gemstone beads and yellow quartize faceted beads all make up this lovely charm bracelet. Fastens with an antique bronze tone clasp. Perfect any time of the year when you want to think of flowers in bloom. The keyring has a 9p Red Squirel stamp on it and the magnet has an image of a Red Squirrel. This cute owl pin cushion has been made using a combination of machine and hand stitching. It is generously stuffed with polyester toy filling. Folksy :: Buy "purple swirl lampwork beads"
This is a set of handmade lampwork beads which features a square focal approx 6mm in size. It also has 2 ivory spacers and 2 purple spacer beads. They have been handmade by me in my studio and then annealled in my kiln for durability. Vivid green peridot 8 mm semi-precious gemstones are enclosed within wavy hematite rounds to make this stretchy bracelet. The neon green make this one of the 'must have' bracelets for the spring and summer. I have made the bracelet using strong stretchy elastic thread, so that there is some range in its size. 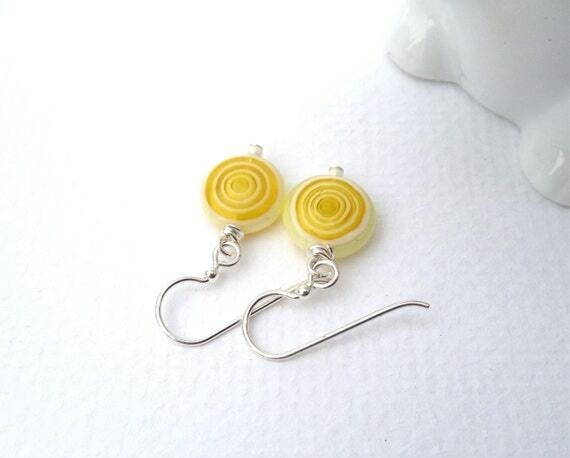 A sweet drop style earring inspired by the return of the sun. Made from a 10mm blown glass disc and a pearl color glass seed bead. Wire wrapped and suspended on sterling silver ear wires. Total length is about 1-1/4 inches. A 45mm pin badge featuring a cute owl. Pin the badge onto a birthday card, to your coat, handbag, purse, backpack, guitar strap etc. Fully customizable - you pick the color combination, numbers, orientation, size, font. 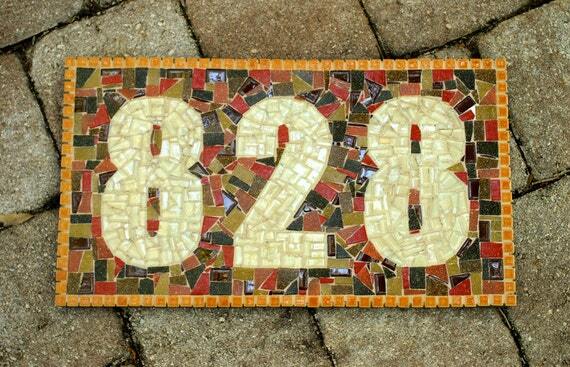 Mosaic house number plaques make wonderful housewarming gifts! Protect your tablet or eReader with this padded case. - useful inside pocket to store notepad, earphones, etc.